During the second or third century of the Common Era, the scribes substituted the words Ky′ri·os (Lord) and The·os′ (God) for the divine name, Jehovah, in copies of the Greek Septuagint translation of the Hebrew Scriptures. Other translations, such as the Latin Vulgate, the Douay Version (based on the Vulgate), and the King James Version, as well as numerous modern translations (NE, AT, RS, NIV, TEV, NAB), followed a similar practice. The divine name was replaced by the terms “God” and “Lord,” generally in all-capital letters in English to indicate the substitution for the Tetragrammaton, or divine name. “The American Revisers, after a careful consideration, were brought to the unanimous conviction that a Jewish superstition, which regarded the Divine Name as too sacred to be uttered, ought no longer to dominate in the English or any other version of the Old Testament, as it fortunately does not in the numerous versions made by modern missionaries. . . . This personal name [Jehovah], with its wealth of sacred associations, is now restored to the place in the sacred text to which it has an unquestionable claim.”—AS preface, p. iv. A number of translations since then (An, JB [English and French], NC, BC [both in Spanish], and others) have consistently rendered the Tetragrammaton as “Yahweh” or have used a similar form. Under the heading Jehovah (In the Christian Greek Scriptures), evidence is also presented to show that the divine name, Jehovah, was used in the original writings of the Christian Greek Scriptures, from Matthew to Revelation. On this basis, the New World Translation, used throughout this work, has restored the divine name in its translation of the Christian Greek Scriptures, doing so a total of 237 times. Other translations had made similar restorations, particularly when translating the Christian Greek Scriptures into Hebrew. Such agreement from Hebrew versions exists in all the 237 places that the New World Bible Translation Committee has rendered the divine name in the body of its translation. — NW appendix, pp. 1564-1566. Already from the beginning of times there were people who did not like to spread the name of the Divine Creator. We should all be aware nothing has changed Who created all wonders of nature. Several people do everything to have the Name of the Divine Creator not be known. they would not like to see others having enjoying a close relationship with Him who is the Sovereign Master. “Satan” or the adversary does not want you to know Jehovah by name. How, though, does Satan blind people’s minds? 4 Therefore, since we have this ministry through the mercy that was shown us, we do not give up. 2 But we have renounced the shameful, underhanded things, not walking with cunning or adulterating the word of God;+ but by making the truth manifest, we recommend ourselves to every human conscience in the sight of God.+ 3 If, in fact, the good news we declare is veiled, it is veiled among those who are perishing, 4 among whom the god of this system of things*+ has blinded the minds of the unbelievers,+ so that the illumination* of the glorious good news about the Christ, who is the image of God,+ might not shine through.+5 For we are preaching, not about ourselves, but about Jesus Christ as Lord and ourselves as your slaves for Jesus’ sake. 6 For God is the one who said: “Let the light shine out of darkness,”+ and he has shone on our hearts to illuminate them+ with the glorious knowledge of God by the face of Christ. (2 Corinthians 4:1-4-6). The gods of this world blind many and the adversaries of God managed to get far by creating a lot of confusion in people’s mind. Certainly with taking away the Name of God out of the Holy Bible or the Holy Scriptures they managed it that many became so confused that they could not see clear any more in the different characters of figures in the Bible. seeing at so many places the world ‘lord’ they do not know any more of which lord is been spoken. As such “Satan” has also used false religion to hinder people from coming to know God by name. For example, in ancient times some Jews chose to ignore the inspired Scriptures in favour of tradition that called for avoiding the use of God’s name. By the first centuries of our Common Era, Jewish public readers had evidently been instructed, not to read God’s name as it appeared in their Holy Scriptures, but to substitute the word ʼAdho·nai′, meaning “Lord.” Doubtless, this practice contributed to a tragic decline in spirituality. Many lost out on the benefits of a close personal relationship with God. What was his attitude toward Jehovah’s name? “You have made the word of God invalid because of your tradition.” (Matthew 15:6). We should wonder if we would like to take the tradition of those Jews or certain churches, and continue not using the Name of God. Faithful followers of Jesus continued to make God’s name known after Jesus’ death and resurrection. Jesus’ apostles and disciples continued in the tradition of their master teacher and used God’s name in their inspired writings. All those translations where is only written ” that whosoever shall call on the name of the Lord shall be saved” do not give a clear picture which lord has to be called on. Translations which use: “whoever calls on the name of ADONAI will be saved.’” however do not leave a doubt. In the early 20th century Bible translations in case the Name of God was not used they mostly placed full capitals, so that people still could see that it was the Lord God been spoken of and not the Lord Jesus Christ. But nearing the end of the 20th century the use of capitals was put aside and people could not see any difference between the Lord God Jehovah (Lord of Lord of lords) or His son the Lord of lords or Lord of the Sabbath, Jesus Christ. Many miraculously shaped in their mother’s womb, got their cells and their DNA sown by the Most High Creator of heaven and earth. You would think they would like to know the Founder of their being and to get a good relation with Him. For building a good relation we do have to come to know the person very well. And when we do really love somebody we do use his or her name and not a detached “sir”, “lord” or “madam” or “misses”. “God . . . turned his attention to the nations to take out of them a people for his name.” (Acts 15:14). Nevertheless, the enemy of God’s name did not give up. Once the apostles were dead, the opponents of God, the wicked ones and His enemies, wasted no time in sowing apostasy. When apostate Christians made copies of the Christian Greek Scriptures, they evidently took Jehovah’s personal name out of the text and substituted Ky′ri·os, the Greek word for “Lord.” The Hebrew Scriptures did not fare any better. No longer reading God’s name aloud, apostate Jewish scribes replaced the divine name in their Scriptures with ʼAdho·nai′ more than 130 times. The influential translation of the Bible into Latin that was completed by Jerome in 405 C.E. and that came to be called the Vulgate similarly omitted the personal name of God. Clearly, this Vatican directive is aimed at eliminating the use of God’s name. Deleting God’s name from his written Word and replacing it with “Lord” hinders readers from truly knowing who God is. Such a substitution creates confusion. Thus, many churchgoers are hardly aware that the true God to whom Jesus directed his prayers is a Person with a name — Jehovah. You may be convinced that it does not really matter, but did you ever thought it perhaps could be really very important. those who pray ‘the Lord’s prayer’ did they ever think what it would mean to “hallow God His Name”? As it was important for the son of God, Jeshua (Jesus Christ) to have people get to know his Father’s Name, it is still important today that as many people as possible come to get to know the Name of the Most High God. It is true our world still may see a war going on against the divine name and against those who like to use the Name of God. The adversary of God has cleverly used false religion in the process. However, the reality is that no power in heaven or on earth can stop the Sovereign Lord Jehovah from making His name known to those who want to know the truth about him and his glorious purpose for faithful humans. If you are interested in getting to know more about that God with His special or set-apart (holy) name, we would be pleased to come to talk with you are to bring you in contact with people who could give you a Bible study. May we first advice you to start yourself putting all doctrines you might have learned in your early church life or of which you might have heard, to put them away, to have an open mind to receive the words of the scriptures like they come to you. To have not to many difficulties to know about whom is spoken, you best use a Bible where the Name of God is used, either by the placing of the Tetragammaton or by the Name Jehovah or Yahweh. choosing a Bible with Jehovah His name in it, you soon will get the picture and shall come to understand who is who. Please do not hesitate to ask us question should they arise, and make an effort to regularly read the Bible, the Word of God. While there do seem to be particular individuals that the Lord provides the gift of healing to on a more regular basis it seems that healing in the Christian church is more about corporate faith than it is about individual faith. There is also a somewhat inexplicable nature to who gets healed and who does not get healed and the reasons why healing does or does not occur. I know it doesn’t make sense to cooperate with a supreme being who has no need of you. But while I have been very perplexed by the role of Sovereignty in Divine healing I have also come to recognize the role of human agency. That God has a specific Will that people can know and act on, and if they do not act upon will not happen, is a rather strange concept to a Calvinist. Yet, again and again I have seen this principle demonstrated in the healing ministry. God does not need to be distinguished from other gods. Some translators have made this statement. Who are we to say that God doesn’t need a name ? God deemed it necessary to name all the stars in the heavens, and to place his name upon people that he liked, and upon places that were important to him. His own word the Bible – emphasizes the importance of a name. The translators of the Bible did not remove Satan’s name from the Bible – nor did they remove the names of numerous false gods from the Bible.“non-superstitious Jewish translators always favored the name Jehovah in their translations of the Bible. Call upon ”Jehovah” and His Saviour The Jews looked forward to a Jewish Messiah that would be sent to them by Jehovah God. This Messiah would bring Salvation to them. He was to be Jehovah’s means of Salvation – hence, he would bear the name “Jehoshua”which means Jehovah’s Salvation. All this information was snuffed out by the Romans when they attempted to blot out the Jewish Connections to Christ. The Romans made Christianity their state religion shortly after the Apostles died. The Romans corrupted Christianity to a great degree, by destroying Christ’s connections to Judaism and replacing them with pagan religious teachings and holidays. Correctores were hired to alter the bible in thousands of places – in an attempt to distance Christ from his Jewish heritage. 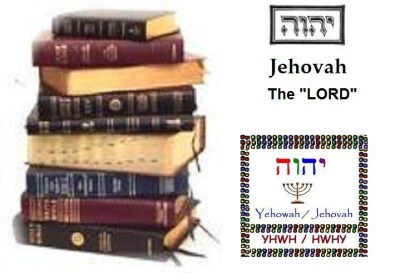 The name of Jehovah was replaced by “LORD” or “GOD”. Other scriptures were also deleted, added or altered in order to support the new state religion. One of the most fascinating parts of the seminar involved reading an old fragment of the Greek translation of Deuteronomy 31, during which one of the professors in attendance made what we thought was a joke about early Christians misreading the name for the LORD in the synagogue and saying “Pipi.” Turns out…he wasn’t joking. The reason behind this embarrassing mistake provides a nice little (short) tour into the world of scribal habits and ancient manuscripts. According to Jewish tradition as later codified in the Mishnah (specifically the Halakha), when the Hebrew Bible was read in the synagogue by Jews – and possibly even earlier in the first temple period, though that is debated – the covenant name of God was usually not pronounced (according to some Jewish writings, YHWH could be spoken, or, rather, sung, in some circumstances, such as priestly prayer or when reciting the Numbers 6 benediction). Rather, they substituted “Adonai” any time YHWH appeared in the text, and if they needed to refer to YHWH as the written name, they usually called it “HaShem” (The Name). Honoring this tradition, the Masoretes inserted the vowels for “Adonai” everywhere YHWH appeared, functioning as a sort of global “replace-all” to indicate what should be read aloud (qere) from the written text (kethiv). Prior to the release of the New World Translation (NWT), Jehovah’s Witnesses generally used theKing James Version or the American Standard Version of the Bible. Early literature produced by the Witnesses quotes these versions and uses them for source documentation. Because of the fact these versions employed the use of the English language in its antiquated form, a need arose to have a modern translation that updated such dated vernacular. Consider, it was not merely by chance that Jesus taught his followers to put God’s name first in their prayers. (John 6:9) That name was clearly of crucial importance to him, since he mentioned it repeatedly in his very own prayers. On one occasion when he was praying publicly to God, Jesus was heard to say, “Father, glorify your name!” And God himself answered, “I have glorified it, and I will glorify it again.” (John 12:28, the Jerusalem Bible.) This is one of the three recorded times that God himself spoke directly from the heavens to the earth. Clearly, an important issue. Expressions such as G..d..n are commonly used in all, or most languages, everyday. This kind of abusive talk demeans Jehovah and his grand name. It should reflect on our lack of accurate knowledge; and a flagrant contempt for Jehovah and his magnificent name. Who among us would appreciate the name of a loved-one used in this insulting context? God has seen his name and reputation sullied over the centuries.Names designate and distinguish us from others. Our name identifies us as this specific individual, with these particular qualities. It is one of the most important ways a person is known and recognized. His name, Jehovah represents him. Jehovah is the name of the one true God. God’s name was chosen by him. For an individual to know God and all that his name means and represents, signifies more than a mere acquaintance with the word. (1Chron. 6:33) It actually means knowing the person—-his purposes, activities and qualities as revealed in his word. When people use titles such as; God, Lord, Dios, or Theo instead of using his personal name, Jehovah becomes devoid of distinction and identity, as the rightful sovereign of the universe. They mistakenly believe these words are God’s name. God spelled with a capitol “G,” is defined as a being conceived as the perfect, omnipotent, omniscient, originator and ruler of the universe. He is the principle object of faith and worship in monotheistic religions; also defined as a very handsome man and/or a powerful ruler or despot. Does anyone see the abject manner in which our loving Father is treated; the desecration of his holy name. In comments to my previous posting (about some recently published Oxyrhynchus papyri), the question was raised about how the divine name (YHWH; יהוה) was handled in earliest Greek translations of the Hebrew scriptures. In Septuagint manuscripts (dating from ca. 3rd century CE and later), “Kyrios” (Greek: “Lord”) is used rather frequently. But some have proposed that the earliest practice was fairly consistently to translate YHWH with “Kyrios” (κυριος), others that the Hebrew divine name was initially rendered phonetically as ΙΑΩ (“Iao”), and others that the divine name was originally retained in Hebrew characters. To my knowledge, the most recent discussion of the matter is the recent journal article by Martin Rösel, “The Reading and Translation of the Divine Name in the Masoretic Tradition and the Greek Pentateuch,” Journal for the Study of the Old Testament 31 (2007): 411-28. 1) So many pages 2) Those seemingly endless pages are sooooo thin. 3) It seems difficult to read 4) Seems difficult to understand. Etc Etc Etc….The thing is, while all of those and more may seem or even possibly be true….the Truth is, the more you Keep On reading it, Keep On seeking its information, the more the above intimidating distractions, which satan uses to discourage you with, will disappear and the information comes out like a flaming torch of light. The Hebrew letters are named Yod-Heh-Waw-Heh: יהוה; note that Hebrew is written from right to left, rather than left to right as in English. In English it is written as YHWH, YHVH, or JHVH depending on the transliteration convention that is used. The Tetragrammaton was written in contrasting Paleo-Hebrew characters in some of the oldest surviving square Aramaic Hebrew texts, and it is speculated that it was, even at that period, read as Adonai, “My Lord“, when encountered.According to Jewish tradition, in appearance, YHWH is the third person singular imperfect of the verb “to be”, meaning, therefore, “God is,” or “God will be” or, perhaps, “God lives”. This explanation agrees with the meaning of the name given in Exodus 3:14, where God is represented as speaking, and hence as using the first person — “I am”. These days the Christian Bible is usually regarded as the Greek New Testament added to the Old Testament, which is a reordering of the Hebrew Bible. If we read the Bible in English, we do so in the assurance that the first part is soundly translated from the Hebrew and the second from the Greek. Catholics include some Jewish Apocrypha, those Scriptures without Hebrew originals (and several most likely composed in Greek anyway), while Protestants reject them. This entry was posted in Creator God, History, Jesus of Nazareth, Religion, Trinity, World and tagged 1° Century, 2° Century, 33 C.E., 3° Century, Adonai, Adversary of God, American Standard Version (ASV), Apostle John, Bible translations, Calling unto God, Christian Greek Scriptures, Christians, David Clines, Divine Creator, Divine name, Douay Version, Early Christians, Exegesis, False religion, Foe, god of this system, Hebrew prophets, Hebrew Scriptures, Holy Scriptures, Jehovah, Jerome, Jerusalem Bible, Jesus’ ministry, Jews, Justin Martyr, King James Version, Kyrios, La Biblia Latinoamérica, Lord, Lord of the sabbath, Name of God, New American Bible (NAB), New International Version (NIV), New World Translation (NWT), Old Testament, Pentecost, Reina-Valera version, Relationship with God, Religious leaders, Satan, Septuagint, Sovereign Master, Spirituality, Tetragrammaton, Theos, Translations of the Bible, United Bible Societies (UBS), Vatican, Vulgate, Yahweh. Bookmark the permalink. Not to mention that yehoshua, is the tetragrammaton with the hebrew letter shin, or spirit in it. the Quintessence, the fifth element, tiferet if you will. Like Jeshua only wanted to do the will of his Father in heaven we also should try to do that. Jesus totally gave himself to make himself like God wanted, in the image of God in“heart mind” a combination of analytical and emotional intelligences. The demiurge or nature with the heart may not be underestimated. Jeshua, in his ministerial work gave us a task. He never claimed to be God or to be like God, but assured the world he was not here to do his will, but the will of his Father. It was not his work he was doing but he wanted to work for God, without Him Jesus could do nothing. the followers of Jesus Christ should also try to live like Jeshua and should be doing God’s work here on earth. By doing God’s work we can come to understand God’s perspective. but that will not go as easy as many think. We ourselves do have to give ourselves totally in the Hands of God. We should be prepared to put ourself aside and to give us totally in the Hands of God. Jesus asked us to become like him. We therefore do have to work on ourselves and on our faith. We should try to become like Christ and become in union with Christ as Christ was in union with God. This Christ being one with God, like we should be one with Christ and one with God, does not mean we become Christ nor that we would become God. Like Christ was not God , we shall not become Christ, though we could be one with him. Also being in union with God that shall not make us to be God Himself. We should come to see that “becoming like God” is something what the Divine Creator God wants. God can’t be appreciated unless He is understood and as the writer of ‘FinScribe of wisdom’ correctly reminds us of Manly Palmer Hall who said “A man will not reproduce without corruption that which he has not comprehended.” we should first come to learn more about God and try to come to understand Him, His works and His aspirations. They stay two different entities, Jeshua being the man of flesh, blood and bones, opposite the eternal Spirit, a Supreme Being without blood, flesh and bones. After Jesus was taken out of the dead,after having been three days in hell, he gave proof to the people who saw him that he was no spirit, by showing his wounds. God can not be seen by man, or they would die. Fin, the writer of the article “Jakob Bohme symbol- tetractys,Tetragrammaton ” points us to come to see that Jacob Bohme is trying to communicate to us is that in man is God. In a certain way Jacob Bohme is right. In us we do all have an element of God in us. – In Man God-Immanuel, Jesus or Yehoshua means “god saves”. Jesus was given to the world to save us all. We can either take him or leave him. It is to each individual to accept or to reject Jeshua, Christ Jesus, as their Messiah. Everybody is free to allow Jeshua in their life and to let him transform ourselves. The Christ consciousness dwells within us in the form of reason. We should use the reason of Christ to transform ourselves and to become more and more like Christ and to become more and more brother or sister in Christ. I am curious as to whether you see Pope Francis calling the story of Adam and Eve as having an influence on Jesus dying for our sins. Wasn’t that death to redeem us from original sin? The story of Adam and Eve has influence humankind and on Jesus dying for us, him being the 2° Adam. Made directly by the Divine Creator, he had again similar qualities as the first Adam, though also bearing the faults of human beings, being nurtured in the womb of a woman. He had to learn everything whilst the 1st Adam did not have to learn everything, because knowledge was in him. Created in the image of God, like the 1st Adam and we, Jesus could be tempted and sin. He resisted temptation and managed to follow the Will of his Father. He offered himself as a Lamb and being without sin he was the complete offer. Not being Catholic and not so following the teachings and writings of the pope I do not know what Pope Francis said about the story off Adam and Eve. As such I am not well placed to give a good answer on your question, sorry. But I do hope this answer can give you an idea of how we do interpret the relationship of the first man and the second new born man, the first and the second Adam. Thank you very much for giving notice of you liking and reblogging one of our articles.